I was going to wait until March 16th to share this ultra green tapenade, in honour of St. Patrick’s Day, but It turned out so darn good that I decided to post it sooner. I literally moaned when I took the first bite, then wiped the food processor clean with my fingers. No bread required. I made it another two times just to be safe. Yup, still moaned. I’ve been wanting to share an artichoke recipe for a while, and since they’re in season now in Italy, it was perfect timing. My only dilemma was that I had never cooked with fresh artichokes before. I’ve used the canned/jarred kind in recipes and dips tons of times, but I’ve always made the fresh ones simply steamed and then eaten them dipped in Mama’s Lebanese Salad dressing, like she used to make for us when we were kids. Truth is I’ve been afraid to tackle the task of cleaning and prepping the fresh hearts for a recipe. A few weeks ago we visited my in laws in beautiful Tuscany and my mother in law, mamma (with a double m, single m is my mama), made a delicious spelt linguine with fresh artichokes. I picked her brain and took some pointers and also found a great tutorial online and decided to face my fears head on. I thought I’d start small, in case the attempt was a failure, I didn’t want to waste too many (luckily it was much easier than I expected). I decided to make a tapenade and paired the artichokes with pistachios, as they were on my mind from having seen Audrey’s recipe for pistachio ice cream (YUM), and because I hadn’t really done much with them on the blog except for having used them as a topping in my Orange Blossom & Tahini Cookies (please tell me you’ve made these, cause if you haven’t get to it immediately after you make this dip). A word about the ingredients. Artichokes have diuretic properties and aid in reducing water retention, stabilizing the metabolism and lowering blood cholesterol. They are rich in fiber, vitamin C, magnesium, calcium, iron, folate and many more vitamins and minerals. Two facts I find surprising is that one medium artichoke contains 4 grams of protein and 400 mg of potassium, the same amount of potassium as a small banana, but without the fruit sugar. The only issue is that much of this water soluble mineral is lost in cooking, so using the cooking water is important. They’re at their peak in February here in Italy, while I believe California artichokes are available in the spring. The season is so short that this vegetable is often preserved so you can get it all year round. If you want to enjoy them year round, look for a good quality brand with few ingredients and no funky words you can’t pronounce, and go for the glass jar and not a can, preferably. 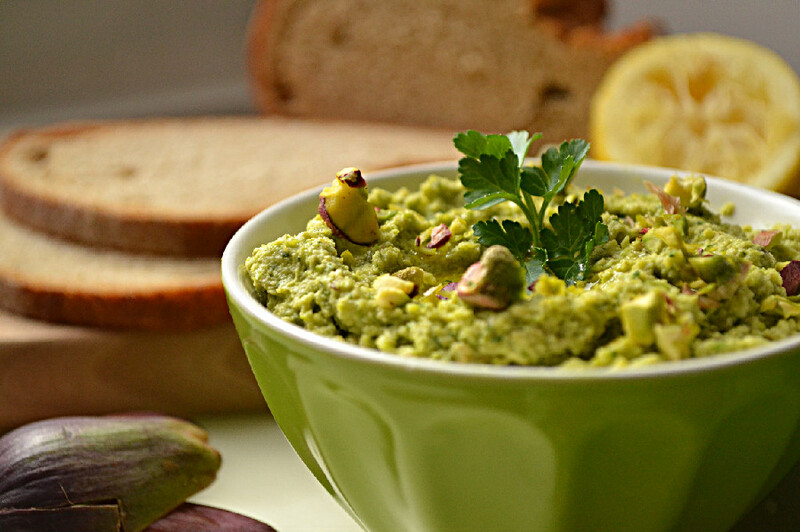 Pistachios, another key ingredient in this tapenade, are a wonderful nut. They are rich in protein, fiber, calcium, iron and vitamin B6 in particular, among many other vitamins and minerals. They are sweet and mild in flavour and also happen to contain fewer calories and more vitamin K and potassium than any other nut. So what’s up with Potassium? When I created this recipe, I hadn’t intentionally loaded it with potassium rich foods, it just sort of happened as I thought about the flavours I wanted to combine, artichokes, pistachios and parsley, all naturally good sources of potassium. It kind of makes you wonder about the power of nature, like attracts like. So why is potassium important? Potassium in an important macromineral and electrolyte that regulates water balance and blood pressure and controls the acid base balance in the body. It is essential to our cells, tissues and nerves, it regulates heart function and blood pressure, builds protein, metabolizes carbohydrates and helps eliminate waste. In short, potassium is extremely important in the diet and we should aim to get about 2.5 to 3.5 grams a day according to many sources. However, it’s extremely important to get this from quality whole foods and not canned and processed foods with added sodium. Since sodium depletes the potassium, we should consume twice as much potassium as we do sodium. This can be easily accomplished by cutting out processed foods and eating naturally prepared whole foods. Some healthy plant based sources of potassium include bananas, artichokes, pistachios, parsley, sweet potatoes, tomato sauce, beet greens, mustard greens, green beans, and prunes. 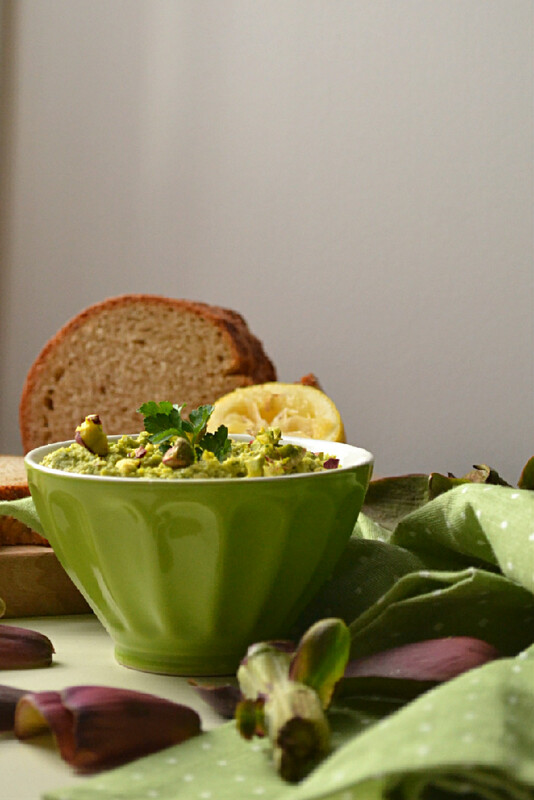 Now that you’re well versed on potassium, here’s the recipe to this gorgeous green tapenade which is so delicious, it will have you moaning at first bite, guaranteed. 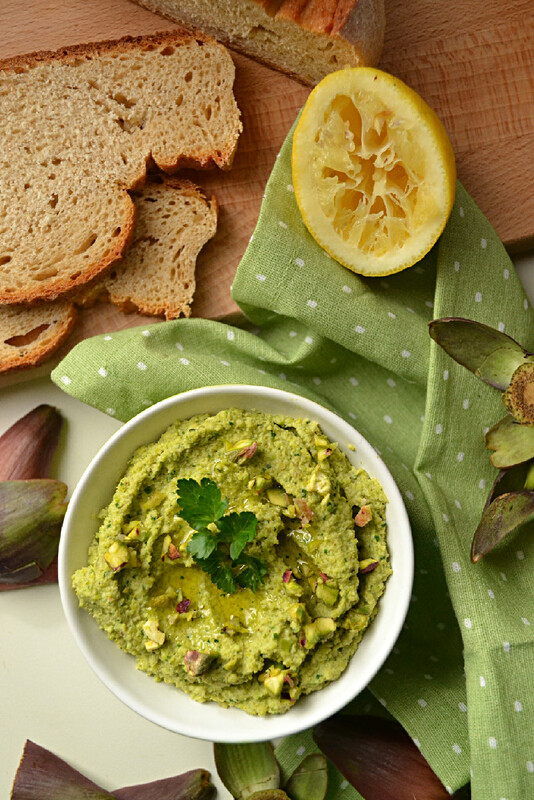 This bright green tapenade is loaded with the goodness of artichokes, pistachios, and parsley with a rich texture and hints of lemon and garlic. It’s sure to be an impressive appetizer and crowd pleaser at our next gathering. Prepare a lemon water bath for your artichokes. Fill a large bowl with filtered water and add 1-2 teaspoons of lemon juice. To clean the artichokes, start by peeling away all the tough outer leaves. As you clean your artichokes, dip them in the lemon water bath to prevent browning. Once you get to the heart, scrape out the prickly part, and completely immerse the artichoke heart in the lemon water bath until you’re ready to use it. Once all your artichoke hearts are ready, you’ll want to cook them. Fill a pot with filtered water, add artichokes and the lemon water bath to the pot and bring to a boil. Reduce heat and let simmer for 25-30 minutes until the artichokes are soft. Remove the artichokes from the pot, reserving the cooking liquid, and let them drain in a mesh strainer for a minute or two. In the meantime, blanch the pistachios by adding them to a pot of water and bringing it to a boil. As soon as it starts to boil vigorously, remove it from heat, and let the pistachios soak for about 5 minutes. Rinse them with cold water, and slip off the skin. It should come off fairly easily. Add cooked artichoke hearts, blanched skinned pistachios and all ingredients except cooking water and oil to a food processor and blend on high speed, stopping every now and again to scrape down the sides. It may take a good 3 minutes to get the consistency of a spread. Add water and/or oil and process again to the desired consistency. I’ve tested both fresh artichokes, which I cleaned to get to the hearts and artichokes preserved in a jar. The fresh artichoke version was my favourite. It was a bit of a process to get to the hearts, but it was well worth it. See this link for a good step by step tutorial on cleaning artichokes. If you use preserved artichokes be sure to adjust the lemon, oil and water in the recipe according to how your artichokes are preserved. If they are canned in water, then the recipe will most likely work as is. However, if they are already quite oily, acidic and salty, from having been preserved in oil, lemon, salt and/or vinegar, then you might want to hold back on those ingredients, blend and add them in later if needed and as required to get the flavour and consistency right. It really wasn’t as bad as I had imagined it to be Audrey, give it a try. I hate canned food, and the good quality preserved artichokes are usually in jars with tons of oil, and it plays with the flavour of the tapenade. So it’s worth it to get the fresh ones. Let me know how you make out. It’s such a delicious spread I love it. Oh and thanks so much for your comment about the photos. I was really happy with these. I think it was a combination of great natural light and a photogenic subject. Would you look at that green colour! !